ArrayDeque in Java is a class that provides the facility of using deque and resizable array. it extends the AbstractCollection class and implements the Deque interface. ArrayDeque is also known as Array Double Ended Queue that allows the user to add or remove an element from both sides of the Queue. ArrayDeque creates a dynamic array which has no capacity restriction. 1. implements the Deque interface. 2. We can add or remove an element from both sides of the queue. 3. ArrayDeque has no capacity restriction. 4. Null elements are not allowed. 5. Not thread safe, in the absence of external synchronization. 6. 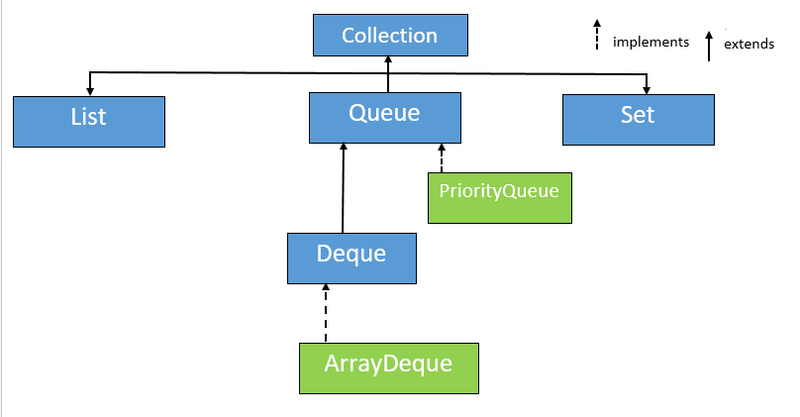 ArrayDeque uses both stack and queue When it is used as stack it is faster than the Stack, and when it used queue it is faster than the LinkedList. 7. It adds no methods of its own. 1. ArrayDeque(): The first constructor creates an empty deque. Its initial capacity is 16. 2. ArrayDeque(int numOfElements): The second constructor is used to create an ArrayDeque that has the specified initial capacity. 3. ArrayDeque(Collection c): The third constructor is used to create an ArrayDeque that is initialized with the elements of the collection passed in c.
How to find the length of ArrayList?